Perhaps worrying that the local branch of CAMRA have been forced to rely on a Beefeater to hold meetings and this is another charmlessly modern affair. The beer is reasonably well kept, however - certainly better than in most nearby establishments. A family of 4 were playing Rummikub and were truly engrossed which was nice to see. Been here a few times, mainly to dine in the Beefeater. It usually serves 4 ales which seem to vary, no interesting micros but decent regional brewers. The bar area is separated from the restaurant so the food part doesn't impose. This place is probably the nearest you will get to a traditional pub (apart from the various Wetherspoons outlets) Central Milton Keynes which I know doesn't say much. Worth a visit ecspecially if hungry. In spite of being attached to a Premier Inn and having a large Beefeater Grill sign outside, this actually appears to be a pub with somewhat more character than most of the nearby establishments. 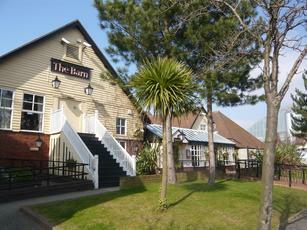 The building to the right looks to be the original barn from which the pub takes it�s name, and next to this is a beer garden. Light wood cladding adorns the front of the pub. Inside, the main bar is a good size, and a pleasant enough place in a bland, corporate sort of way. There are some attractive tiles on the floor as you walk in, but elsewhere the colour scheme is the usual pastel gastro-pub shades. There are however one or two black wooden supports around that presumably remain from the original building, and the rear of the bar had a slightly sloping roof. Flooring is mostly carpet, with some light wooden boards at the rear giving a more contemporary feel, along with a black painted wall and some type of fire-place, although this didn�t look to be used. To the left is a restaurant area, complete with a welcome desk to deter any causal drinkers. Again, this looked pleasant enough with high ceilings and a large brick built chimney being a prominent feature. The fire-place below was stacked high with logs, although I suspect these were more decorative than functional. The menu looked to be the standard, mass produced Beefeater fayre with an emphasis on sizzlers. Barman was a friendly chap. Beer taps on the bar were Woodforde�s Wherry, Banks�s Bitter, Hobgoblin and Jenning�s Sneck Lifter, although disappointingly two of these were off. The solitary cider was Strongbow, unfortunately. Hello , my name is marcus , im the handsome one with curly hair that works at the barn :-) im a real big geek when it comes to ale so this week we'll be selling breakspear, adnam's , hobgoblin and when one of them runs out woodfords werry . so come on down and try them cos the more i sell the better it tastes :-) watch this space ! It's okay but it would be nice if once in a while the real ale was on!